There's three options to choose from. Basic, Burl and Wood. Prices in the charts are for handle Basic, for Burl there's a an extra of 19€uros and for Wood there's an addition of 29 €uros on the prices. Extended is 10€uros extra regardless of what model choosen . Custom has no fixed price, it set from handle to handle. 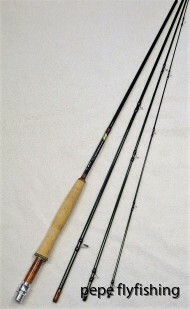 Rods for the true purist and the delicate fishing with long and thin leaders, mainly in smaller streams and ponds. The Classic rods are realy smooth and slow in the action but still light and crisp in the presentation. Quick loading, fast action rods with plenty of feeling. One of the most all-round rodseries I have. 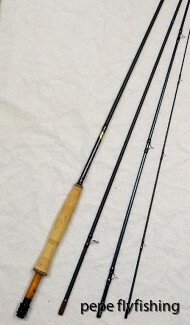 Fast, progressive rods with a short loadingstroke. Works just as good for speycasting as for overheadcasting. Very thin diameter on the blank that makes them cut the wind with very little resistance. 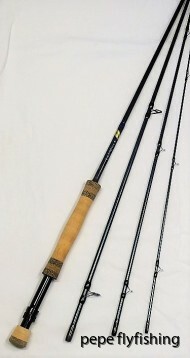 Nordic inspired 5-piece rodseries for shorter transportlength. Slightly deeper then the Bleu Acier but handles all types of casts and acceleration. 6-piece travelrods with smooth, crisp action and speed. 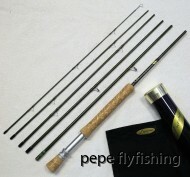 Very popular rods with smooth loading and great power compared to the old glassrods. Fast, powerfull rods that loads with just a few overheadcasts. 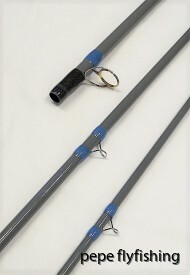 2-piece customrods designed for fishing with heavy nymphs. The key in this fishing is a long, light rod in a low lineweight. 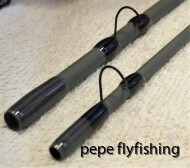 Together with one of the best nymphfishermen, Mauro Mazzo, I have designed these superb rods for nymphing! Delivered in rodsock and leathertube. 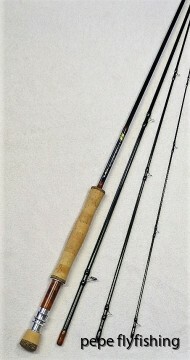 Fast action rods with crisp tip and quick recovery. The best of the best from SAGE. Here's what I have in stock regarding prebuilt rods that's up for sale. Can be both brand new and demorods. Fast action, light rod with lots of precision. Delivered in rodsock and aluminiumtube. 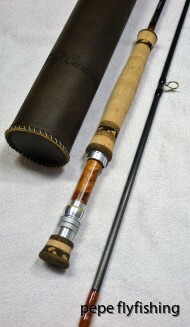 A superb medium action rod. Great for travel with a transport length of 55cm. Olivegreen blank with lightbeige wrappings. Delvered in rodsock and aluminium rodtube. 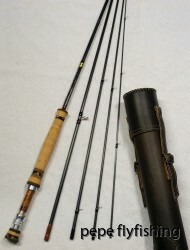 Fast action powerful rod suited for hard fishing in lakes or coastal. 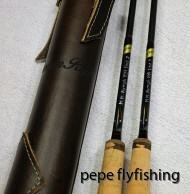 The best of the best that I can build in terms of balance, low weight and medium fast taper that works deep down in the rod. Black snakeguides with dark wrappings. ALPS carbon reelseat.Handle with inserts of burlcork. Delivered with rodsock and carbon rodtube. 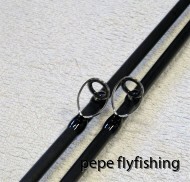 Crisp rod for nymphfishing where the rod should be hold high to get a direct contact with the fly. 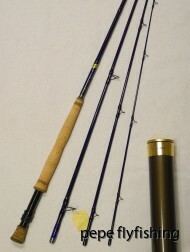 Fast action rod suited for Coastal, Pike, Saltwaterfishing but also big game in rivers like Salmon, Seatrout and Steelhead. Crisp rod for the true purist that fish with long thin leaders. 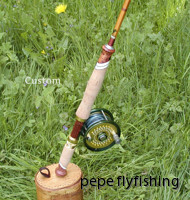 Best suited for small streams and ponds. Delivered in rodsock and alumiumtube. Beast of a rod is the best way to descibe it but this rod still cast with feeling but it's when the Tarpon has taken the fly that the rod comes in it's true element. Black ALPS reelseat and snakeguides. Delivered in rodsock and carbontube.